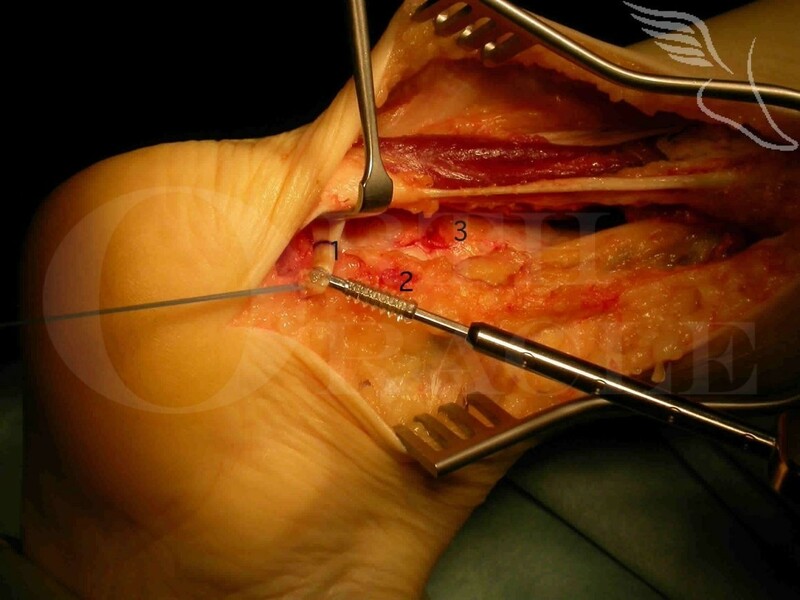 Learn the Achilles Reconstruction – Arthrex Biotenodesis screw with Flexor Hallucis Longus tendon transfer surgical technique with step by step instructions on OrthOracle. Our e-learning platform contains high resolution images and a certified CME of the Achilles Reconstruction – Arthrex Biotenodesis screw with Flexor Hallucis Longus tendon transfer surgical procedure. The Flexor Hallucis Longus transfer for Achilles reconstruction is a straight-forward and effective operation for salvaging various situations which have resulted in a deficient and de-functioned Achilles tendon. The flexor hallucis longus tendon is easily accessed sitting just anterior to the Achilles tendon and can be safely harvested as long as care is taken to identify and avoid the posterior tibial neuro-vascular bundle. It has not been my experience in performing this procedure for over 15 years that any more than a single incision is required to access and harvest adequate length of the FHL for reconstruction. If the tendon is slightly too short for a bone anchor it can be woven into the native Achilles insertion and sutured. The Arthrex Biotenodesis screw is a useful implant to anchor the harvested tendon into the calcaneus, though the tendon can be woven into the native Achilles insertion also. The key is appropriate tensioning of the transfer. Despite the slightly more involved nature of surgery compared to primary Achilles repair the period of immobilisation and recovery and outcome are little different.